You can find your purpose in life right now. 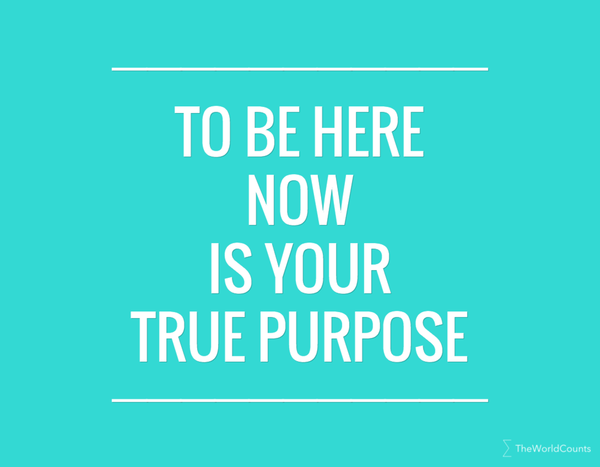 Because your purpose is to be here, right now. In this very moment. What is your life’s true purpose? Have you ever asked yourself what your life’s true purpose is? The purpose that will give your life meaning, and make you happier. There is no easy answer to this sort of big question, but perhaps the act of finding a meaningful life purpose is simpler than we think. 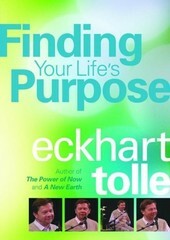 According to Eckhart Tolle, a spiritual teacher and best-selling author, the question of finding your life’s purpose is best approached by realising that there is a primary and a secondary purpose. And they differ remarkably in their nature. It is probably easiest to relate to the secondary purpose - and this is perhaps also why it is that concept which is being discussed, debated and written about most of the time. Secondary purpose has to do with finding your “mission” or your life’s “call”. And for this reason it is also primarily concerned with where you want "to go” in your life. Many books and articles have been written on this topic, and how to find out what it is that you truly want in life. If you are interested in finding out more about this here is a good place to start. The “problem” with this type of purpose, however, is that it implies future. Or put simply… we basically need time to get there. And this is where the secondary purpose differs from the primary purpose. Primary purpose does not involve time. In fact - and as simple as it may sound - the primary purpose of your life is to be, exactly where, how and who you are, right now, in this very moment. On the surface, this is not a very exciting concept. And it is highly likely that your mind will object to this kind of “life purpose”. But dig a little deeper, and see if you can discover the immensity of being where you are, right now. Indeed, everything has come together, in this very moment, and placed you right here, right now. And your primary purpose in life is to wake up, or align yourself, to that truth. You are here, right now, because it cannot be otherwise. Whereas you will have to look for, and hopefully find, your secondary purpose, your primary purpose is with you all the time, the entire day, every day of your life, and in everything you do. But only if you are aware. If we are not aware of the present moment, then our actions have the tendency to become a means to an end, and we miss the preciousness of the current moment. For instance, when we get up in the morning we think about going to work. At work we want to go home. When we get home and cook dinner we want to eat. When we eat we want to relax with a movie. When we relax with a movie we think about tomorrow. And so on. If we live this way our primary purpose is not fulfilled, and we are essentially living in a conceptual world, with our mind wanting to be somewhere different. Instead, we can give our lives purpose by being here. Right now. Fully. And if you like this idea, then we encourage you to check out the video below where Eckhart Tolle explains more about your true primary purpose. Does the idea of realizing your life's purpose by being here, right now, resonate with you? If so, we strongly encourage you to check out this powerful talk on the topic, given by best selling author and spiritual teacher Eckhart Tolle.